ADYAPANA 2014, will be held for the 9th consecutive year from September 26 to 28 at BMICH, Colombo. 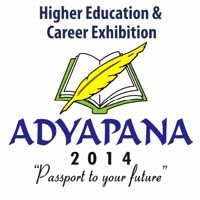 ADYAPANA 2014 organised by the Presidential Award winner Lanka Exhibition and Conference Services (LECS),in collaboration with the Higher Education Ministry, is scheduled to be held for the ninth consecutive year from September 26 to 28 at the BMICH. The S. Thomas College Old Boys’ Association teamed up with the exhibition from last year. The Batticaloa Edition has been fixed for later this year. ADYAPANA KALVI was conducted in Jaffna last month. The event has been renowned as a focused and education oriented exhibition, patronized by keen students who have clear intentions on furthering their education in Sri Lanka or overseas. The Colombo edition is the main event in the series of ADYAPANA Exhibitions. ADYAPANA KALVI was just concluded successfully in Jaffna in January 2014. The Batticaloa edition will also be held at the end of the year. Over 12,000 students visited last year's event during the course of three days. There were over 150 exhibition stalls displaying and informing the general public of various courses, student programs, higher education options and job opportunities. ADYAPANA this year has a partnership with S. Thomas College, Old Boys Association. The organizers of ADYAPANA are Lanka Exhibition and Conference Services and would promote this event in the Maldives as well. The event which will be held immediately after the conclusion of the Advanced Level examinations has consistently drawn students who are looking for immediate opportunities to further their education.